If there’s one meal at which family drama is on full display, it’s Thanksgiving. Expectations and emotions run high, and there are a lot of moving parts to cause friction. 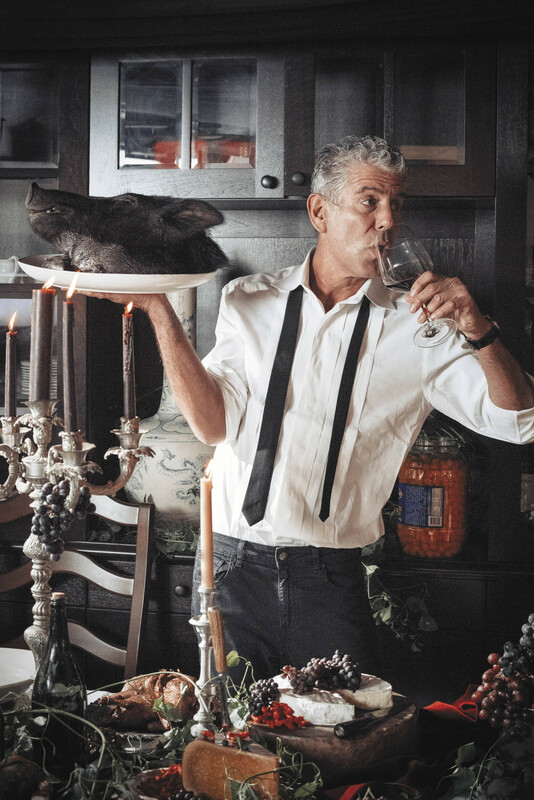 Even the late great Anthony Bourdain, who was seemingly immune to the criticism of others, felt the pressure to pull off the most anticipated meal of the year. In fact, he dedicated a whole chapter to Thanksgiving in the book Appetites: A Cookbook. There, you’ll find recipes from Tony that are capable of distracting from any and all uncomfortable conversations. Below, a list of exactly what you’re doing wrong for the big day. 1. Don’t start cooking on Thanksgiving Day. Preparing your whole meal in one day— even two—is a recipe for system failure. Order your fancy farmer-raised turkey now. Or, if you are going to buy a more plebian bird from a regular market, get your hands on it no later than the Monday before Thanksgiving. 2. You’re not planning well enough. Plan for three days—that’s right, three days—of full-on Thanksgiving prep. Make a list of everything that needs to get done and follow it. The Tuesday before Thanksgiving, you should be organizing your supplies and tools, making sure you have enough roasting pans, mixing bowls, and storage containers ,and banging out advance vegetable prep. 3. You’re not giving yourself enough time to thaw everything out. Do not wait until Thanksgiving to lay out your non-perishables and frozen items. The vast majority of holiday turkeys are sold frozen, and it takes about six hours per pound to defrost in the refrigerator. No amount of prayer, salting, or hastily applied hairdryers can speed up this process if you’ve waited until Wednesday to thaw a 12-pound bird. Your microwave isn’t big enough. You can jolly it along a bit with a cold water bath, which thaws the meat at approximately 30 minutes per pound, but do not float your turkey in your bathtub. 4. Don’t forget to make stock when it’s all over. It’s liquid gold for cold weather. Stock is the underrated superhero of the Thanksgiving meal, the product that comes out of nowhere to save almost everything except your pie. You should make stock out of your Thanksgiving turkey carcass—but the use of a good, dark, gelatinous-when-refrigerated stock that you have on hand before the meal is what’s going to upgrade your stuffing and gravy. Buy about five to seven pounds of turkey wings and necks as the base for a deeply-roasted stock, or invest in a couple of quarts of the best-quality turkey stock you can find a few days (or weeks) before the holidays. Use the stock made from your Thanksgiving birds for winter soups and stews. 5. You only make one turkey? That’s hilarious. 6. Don’t throw away the fat. Do not discard the copious amounts of grease your bird has generously provided you with; use it to boost flavor. Butter is good, but turkey fat is better for delivering quintessential flavor. Save the grease that runs off the roasted birds and use it for the gravy and as a moistening agent for your stuffing. 7. Don’t try anything crazy. This is not the time for wild experimentation. Stick with tradition on Thanksgiving. You have 364 days of the year to experiment with the cuisines of the world, your dehydrator, and your sous vide machine. Give the people what they want on Thanksgiving: the likes of buttery mashed potatoes, savory stuffing with mushrooms or chestnuts or oysters, sweet potatoes with marshmallows, cranberry relish, bacon-enhanced Brussels sprouts, creamed onions, pumpkin or apple pie with real whipped cream, and above all, a straight-ahead bronzed turkey, roasted in the oven. 8. Don’t give it all away at the end of the meal. A good turkey sandwich, enhanced with a layer of stuffing and gravy, eaten in peace after your guests have gone, is the whole point of hosting Thanksgiving in the first place. By all means, send your friends and family home with care packages—but first, make sure you’ve tucked away enough additional stuff for yourself.